County Responsibility for Public School Funding and can cities and towns use taxpayer dollars to purchase school supplies for local schools in their municipal limits? The short answer is no. A portion of your Stanly County property taxes partially fund education. In North Carolina, those tax dollars are allocated by the Stanly County Commissioners. Municipalities do not have the statutory authority to provide for education as those powers are granted and delegated by the North Carolina General Assembly. In rare cases, a city school district may be the local education agency (LEA). Towns such as Norwood cannot use General Fund dollars to pay for any portion of education, school supplies, or athletics at any school inside or outside of their municipal corporate limits. 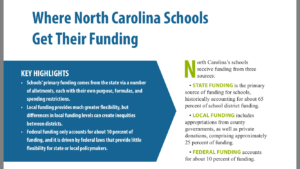 For a brief summary of the basics of Public School Finance, this document from the North Carolina Center for County Research will provide an overview as well as the corresponding NC General Statute. The question of who funds public education often comes up this time of year as the NC Legislature enters its short session and County Commissions begin to hold budget workshops with the local education agency(LEA) that they fund. The chart above illustrates how public schools are funded and provides a brief overview of where the money comes from. In North Carolina, funds for public education are provided primarily from the Federal government, the State of NC, and the County (or City if they govern a LEA). In the case of Stanly County, no municipality or town has jurisdiction or funding requirements over any school. The Stanly County Board of Education receives funding from the three sources above as well as donations by private individuals or foundations, etc. In order to provide some additional information, Kara Millonzi from the UNC School of Government has some additional information in her blog County Responsibility for Public School Funding as well as links to the statutes that might be helpful for those who are not familiar with public school funding. Kara shares both the constitutional and statutory framework for public school funding in North Carolina.